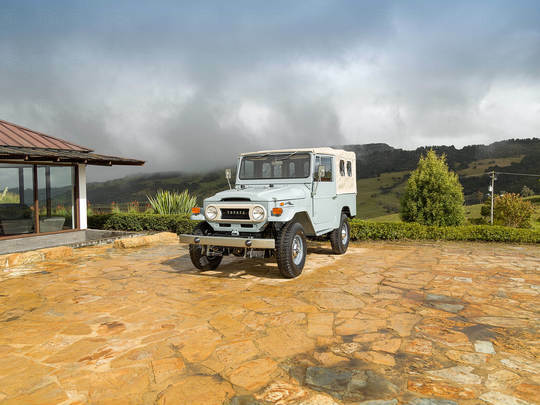 This FJ43 was sold at the Bonhams Quail Lodge Auction, which was held at Carmel’s Quail Lodge & Golf Club in August of 2015. For many years, this FJ43 belonged to a priest who lived in a small town in the Colombian Plains. Its arrival at the town caused much admiration, and curiosity, as it was the first Toyota of its kind in the region. The inhabitants of a neighboring town even dubbed this FJ43 “The Amphibian” because it carried the priest across rivers during the rainy season. Whenever anyone important visited the region, they would be transported in this very same car. During the fifteen-hour-long trips between the capital city of Bogotá and his hometown, mostly over dirt roads, the priest often stopped his grey FJ to rescue less-capable buses, pickups and even small trucks. Eventually, he sold his FJ to a family who lovingly cared for it for many years, which is why we are so excited about this project. It’s truly a restorer’s dream. Although the priest installed a custom-built metal hardtop, we returned the car to its original soft-top configuration, in accordance with the information found in the dealer’s files. Its many special features include a completely original F engine, 3-speed transmission, and contrasting Saddle vinyl interior. Early-style side mirrors, turn signals and a rounded front grille are hallmarks of the early 1970s Land Cruisers, as are the exposed metal interior door panels and authentic dash with its retro knobs and gauges. This very rare 1971 model received a full nut-and-bolt restoration and made its auction debut in August 2015. We upgraded the classic Land Cruiser powertrain to create the G40 Heritage by The FJ Company. Build yours today!